Italy holds an unwavering place high up on many travelers bucket lists - and with good reason. Probably the number one reason you'll hear from everyone who's been there is "the food". Oh my goodness, the food! But surprisingly, there's really no such thing as traditional Italian food. In Italy, distinct regional specialties define what's typically Italian. And while I do love the food in Bologna and Emilia Romagna - considered, even among many Italians, to be some of the best food in Italy - my heart (and stomach) literally belongs in the south since its my ancestral home. 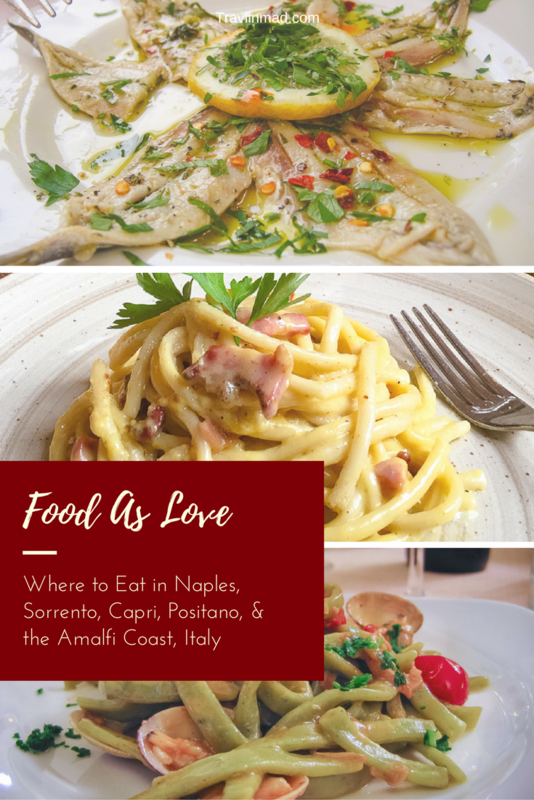 Here are some of the best restaurants and my favorite places to eat from Naples to Amalfi and including the island of Capri. I was especially pleased with the food in Sorrento, Italy -- definitely worth a longer stay there next time. Planning to visit southern Italy anytime soon? Don't miss these restaurants in Sorrento, Naples, Capri, and the Amalfi Coast. This is a very short list and you'll see some of these places on forums again and again. Some, however, I didn't discover until I arrived. They are worth a visit, so start jotting down your dining list! But first: What make these places so special? Pleasant Interaction with Waitstaff and Chefs - all of these places were genuinely interested in engaging with you (but didn't go too far), explained history of the dish, restaurant, or chef, and appeared to enjoy the service. Some of them sang Italian songs, or invited us in near the kitchen, but it was never too much or intrusive. Excellent Service - there's 'pleasant interaction' and then there's excellent service. Knowing your menus, product, and preparation, and then delivering it in a timely fashion is just as important as the meal itself. The service in all the places listed here was Very Good to I Couldn't Have Asked for Anything More. Time to Linger - If Italians do one thing well, it's linger. They savor the moment they're in. They take hours to eat, smoke a cigarette, talk, laugh, drink some limoncello, then start another course - it almost makes me want to take up smoking! But the waitstaff at these restaurants did not push us to hurry so they could turn the table (Americans take note)! Even at the bustling Pizzeria da Michele where the line to get in the small pizzeria is out the door, we felt free to relax and enjoy the entire experience. If you're thinking about skipping this port city on your Amalfi Coast vacation, don't. Go to Naples! Sure it's a "grittier" city as some have described, but Naples offers an authentic glimpse into real Neapolitan life. Although I almost hated it at first, it was for a completely different reason. My advice? Don't shy away from one of the most interesting cities you're likely to find anywhere. Bar Caffe Gambrinus - Just off the famous Piazza del Plebiscito, the historic Caffe Gambrinus had the best coffee drinks of our trip! Every one was insanely delicious, and truly a work of art, as were the tempting goodies and savory bites that accompanied the drinks, coffee or otherwise. Great european atmosphere inside and out! Antonio e Antonio - Good pasta and great desserts, and right across the street from the Santa Lucia waterfront and Castel d'Ovo. Pizzeria da Michele - Seriously, the BEST pizza I've ever had in my life. If you have better, please email me so I know I'm not completely ruined for pizza forever! A hallmark of Capri food is the fine selection of fresh seafood. It just doesn't get much better! Da Giorgio - TRY: Fried peppers with fresh basil, Pizza Napoli with anchovy, Spaghetti with cherry tomatoes. Da Paulino - One of the best restaurants on Capri, Italy, Da Paulino is an open-air restaurant tucked away in a residential part of the island. Ask for a seat outside under the lemon tree grove. TRY: Fresh bufala mozzarella grilled between lemon leaves; Primi - Risotto al limone with baby prawns and arugula; Secondi - grilled seafood and veal cutlet with cherry tomato and arugula salad. Marina Grande Salumeria - I don't remember the name, but this salumeria is right on the water at the port of Marina Grande (with a bright yellow awning). They'll make you the best Caprese Sandwich - fresh bufala mozzarella, marinated tomatoes, and basil on a freshly baked ciabatta roll - what the locals eat. Or they'll make whatever meat and cheese combo you want. Perfect anytime, but especially for a picnic lunch trip to the Blue Grotto or a day on the water. Ristorante Michel'angelo - Serving traditional Caprese cuisine including fresh pastas made daily, this authentic restaurant will soon become a favorite of yours too. TRY: the Grilled smoked mozzarella served with mixed bruschetta, and a fresh pasta of the day. Donna Rosa - This amazing restaurant lies high up in the hills of Positano, so grab a taxi. The food is traditional and delicious, the open kitchen prep is entertaining, and their wine list is well-rounded in selection and price. They also have a seasonal cooking school I've heard good things about, though I had just missed it with the timing of our trip. TRY: Primi - Ravioli ala Donna Rosa and Bucatini al Amatriciana; Secondi - Bresaola (Braciole). Bar Buca di Bacco (on the Positano beach) - Great place for lunch or dinner, and some of the best people watching on the water. TRY: The Pasta Fagiole and Insalata. Ravello Sandwich Shop - Down a quaint side street in Ravello is a salumeria where Anna Maria is the Queen of Sandwiches, and she really is! I forget the name of her store (its just off the main Piazza) but ask around for Anna Maria, and look for the sign taped to the counter. They are super delicious - and one of them makes a perfect afternoon picnic while you stroll around Villa Cimbrone on an afternoon in Ravello. I especially love Sorrento food, and found many good restaurants here, from upscale to takeaway street food. Inn Bufalito - TRY: Buffalo any way! I had the Stewed Buffalo and Potatoes, and the Buffalo leg shank. I also loved their Spaghetti Pomodorini. Basilica - A lovely and comfortable restaurant off the main square in Sorrento, Basilica has amazing pastas and insalata, but it was the Fried, Stuffed Squash Blossoms that got my attention. This was one of the few places to serve them, a traditional Italian dish I didn't see often enough in Italy. And they were to die for! MUST TRY: the Squash Blossoms. Pizzeria di Gigano - I'll never forget the day we found this place. We'd spent the entire day (with two crowded train rides) exploring Pompeii, and we beyond exhausted when we got back to Sorrento. We were so tired but not thinking clearly, and were so hungry but had no idea where we were going. Gigano was like a beacon in the dark, and after our meal you might even say it was divinely inspired. The service, the food, and the jovial atmosphere - everything was wonderful. Tucked down a side street in Sorrento, this pizzeria serves delicious pasta, pizza, and contorni. Over 80 flavors of gelato!